E2k President, Michael Olmstead, working with Chris Wayne and Associates and Futureview, Inc., produced and directed an exclusive summit for top finance leaders from throughout Europe at the majestic South Lodge Hotel and Conference Center in West Sussex, United Kingdom. The event featured British Chancellor of the Exchequer, Alistar Darling, Conservative Party leader, David Cameron; investor/philosopher, George Soros; Paul Volcker, and the Chairman of the Financial Stability Board, Mario Draghi among others. 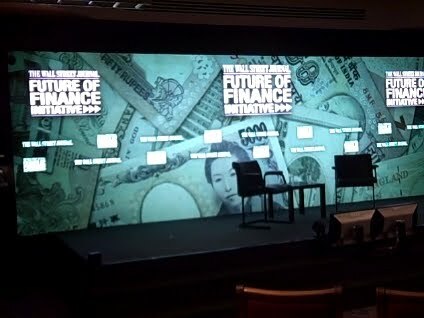 Using the Futureview Prioritizer event facilitation software, the executives generated a series of concrete policy proposals related to different aspects of global finance such as the future of big banks, the top priorities of reform, international regulation and financial innovation. Prioritizer, developed over the past twenty years by Futureview founder, David Hanrahan, provides a large format vehicle for leaders to aggregate ideas and prioritize proposals and follow-up actions. Due to space limitations in the main meeting room, the event utilized a 4 mil LED screen as the stage backdrop and video presentation display. Participants were seated in an intimate, tiered configuration with frequent, town hall meeting-style, interactivity. The UK event was a follow-up to a similar event held with U.S. CEOs in Washington DC in November.